In the legacy of her work as a writer, Anzaldúa reminds us that we have a duty to strike out oppression, build alliances, and fundamentally transform cultures. She underscores that we may achieve these goals through the act of writing. In this spirit, the Conference on College Composition and Communication (CCCC) sponsors the Gloria Anzaldúa Rhetorician Award to support scholars whose work participates in the making of meaning out of sexual and gender minority experiences. Eligibility: Applicants must be accepted to the CCCC Annual Convention program and should currently be enrolled in graduate school or be first time presenters at the Convention. Award Criteria: All candidates should show potential as scholars of rhetoric and composition. We encourage sexual and gender minority applicants, who may (or may not) identify as lesbian, gay, bisexual, transgender, queer, two-spirit, questioning, intersex, asexual, ally, or pansexual (LGBTQ2QIAAP), though applicants who do not see themselves reflected in these categories are also encouraged to apply. Interrogate the intersections between composition/rhetoric research and queer theory. Contribute to the discourses between sexuality/gender identification and writing research, pedagogy, and/or theory. Address issues of social justice, writing, and sexual/gender identification. Forge new conversations in composition/rhetoric and queer meaning-making. 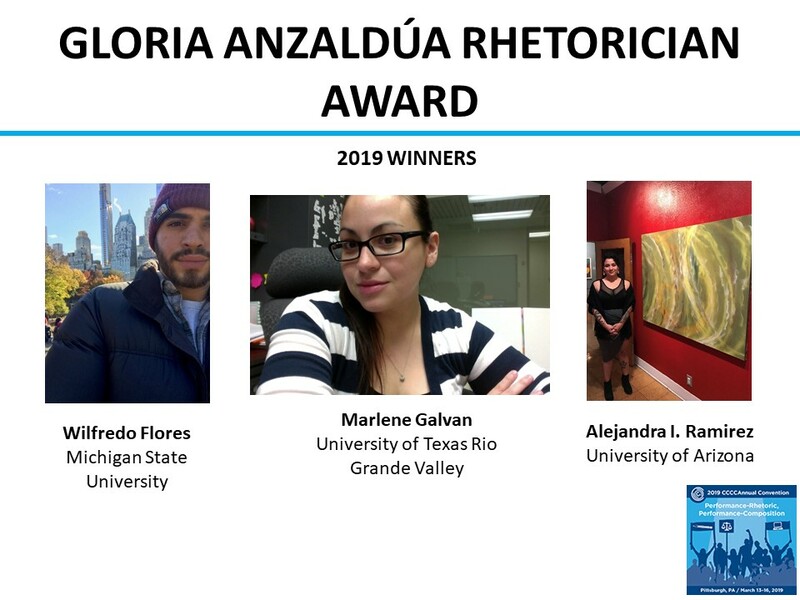 Award Specifics: Recipients of the Gloria Anzaldúa Graduate Rhetorician Travel Award, up to three, will receive $750 for travel-related expenses to present their work at the CCCC Convention. To honor the recipients, CCCC will also host a reception during the CCCC Annual Convention. The Awards Selection Committee will choose up to three winners based on the following criteria: originality of research; critical engagement with and contribution to current scholarship in queer studies and rhetoric/composition; and potential for lasting projects. Applications must be submitted by October 10, 2019, as a single PDF attachment to cccc@ncte.org. Winners will be notified in December. A copy of their accepted proposal (NOT the acceptance letter). An expanded 3-5 page abstract. A brief one-page statement of interest identifying the applicant’s research interests, articulating plans for a career in rhetoric and composition, and including a statement of eligibility for the award.